You all find it difficult? That'll help us in our evil plans! The controls are fairly simple. You control your Mega Gun using your mouse and fire by clicking the left mouse button. If you have purchased a Smart Bomb from the Space Station, you can trigger this by pressing the space bar. And that's all there is to it. Here's an explanation on the parts of the game's interface. 1. Your Mega Gun's target. Move this with your mouse to aim and shoot the Fuzzles. 2. An Evil Fuzzle. Shoot these to get points before they attack you. 3. A land (or in this case, space) mine. Shoot these before they hit you! 4. The amount of Stun Bombs you have. A Stun Bomb can stun Fuzzles for a short period. These may be bought at the station. 5. The amount of Smart Bombs you have. 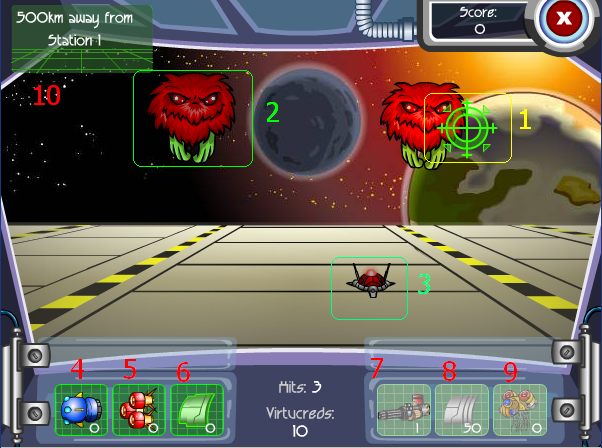 Smart Bombs clear the entire screen of enemies quickly by pressing the space bar. 6. Your shield count. Shields, when activated, provide a defence layer worth 20 hull (health) points. 7. The level of your gun (1-6). The higher the level, the more powerful your gun will be and the fewer shots it takes to destroy a Fuzzle. Upgrades can be bought at the station. 8. Your hull integrity. This is how much health you have remaining and if you run out your game is over. Fortunately, you can buy this at the station. 9. Droid Repair: This is the level of your Droid Repair. Droid Repair constantly restore your hull integrity if it is greater than 0. With each level, the Fuzzles you face will become more and more resiliant, meaning that they will require more shots to destroy them. For example, in the first level all of the Fuzzles are red and only require one shot to destroy. However, in the second level you will face yellow ones, which are tougher and will require two shots to kill. As you progress through the levels, the foes attacking you will require more hits to take down (assuming that you don't upgrade the gun you are given at the start of the game). The number of Fuzzles in each level varies depending on how fast your computer runs and how quickly you shoot them as they appear. The only way to tell when the level will end is by watching the distance timer, once it switches to "approaching station" you can generally shoot 2-4 more Fuzzles before the level ends. Thank you to Shade for compiling this information. Note that as you upgrade your Mega Gun, it becomes more powerful and reduces the number of shots required to kill each colour of Fuzzle. The number of shots necessary to kill listed are for the basic gun you start the game with; if you upgrade your gun at the Space Station to a level 2 then subtract one from each total given. For the third upgrade subtract 2, and so on. So if you upgrade your gun at the end of each level you will only need to shoot each Fuzzle once, regardless of colour... until the grey ones appear. Even with the maximum level 6 upgrade, grey Fuzzles still require two shots to kill. 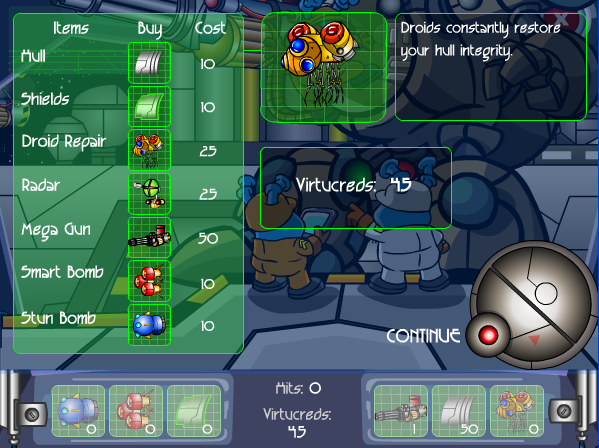 Once you reach the station, the amount of hits you made are converted into points and Virtucreds. (eg. if I hit 45 fuzzles, I would earn 45 points and 45 Virtucreds for that level.) You are able to use your Virtucreds to buy upgrades, as shown in the image below. Please note that you can only have a maximum of five Stun Bombs or Smart Bombs. Prices for gun and Droid Repair upgrades increase with each upgrade. The hull upgrade gives you ten more hull points. Shields, when activated, basically give you twenty more hull points. The Droid Repair upgrade automatically repairs your hull, five points a level. For every upgrade the amount goes up. The radar upgrade lets you know whether or not Fuzzles are coming at you from the sides of the screen. The Mega Gun upgrade increases the power of your weapon, meaning that it takes less shots to destroy a Fuzzle. Smart Bombs blow up all Fuzzles on the screen. Stun Bombs temporarily stun all Fuzzles on the screen. You score one point for each Fuzzle that you kill, but you can create a chain to get even more points. If you destroy a string of Fuzzles in a row without missing, a little sign will appear on the screen showing how large of a chain you have currently amassed. In order to collect these points, though, you have to actually shoot the sign. You can collect them as soon as you like, but the longer you leave it the more points you will eventually get when you cash it in. If you collect your bonus points then the chain will reset and you will start over from zero. Shooting mines doesn't count as having missed a Fuzzle and so won't break your chain, but if you aim for a Fuzzle and miss then your combo bonus will be reset. You don't have to use your Virtucreds as soon as you earn them, you can save them from one level to the next if there is a particular upgrade you want but can't quite afford. Use shields! Shields are effective when you have many Fuzzles attacking you at once. Try to upgrade your gun wherever possible, having more power makes the game much easier! Buy one gun per level (no more) and if any credits remain spend them on repair droids. The repair droids will continually raise your hull throughout the early levels. When you start the harder levels your hull will provide a greater level of protection. Sent to us by feral_shade: Target the Fuzzles BEFORE the landmines. You get a higher possible score per level. The reason: A Fuzzle pair appears when the previous Fuzzle pair dies. Whereas, a land mine appears when the next Fuzzle pair appears. To maximize your score you must maximize the number of Fuzzles you kill so they are alive as brief a time as possible. This cannot happen if you are distracted with landmines. It is better to destroy the landmines during the moment before the next Fuzzle pair appears. This gives the secondary benefit of less land mines. As pointed out by Megweno, one strategy is to try and make a chain of all the Fuzzles in each game and let your bonus points accumulate. Then when the little "Approaching Station" sign appears in the top left corner, hurry and collect them before the level ends. Another strategy suggested by Kitty216996 is to collect bonuses after ten or more consecutive fuzzle kills. After ten or more kills, you have reached the maximum bonus multiplier (x3), which earns you a good deal of points if you collect it multiple times in a level. Finally, as suggested by mememaster: Zygorax's vehicle moves at a speed of 72km/h, which can be calculated by measuring the time it takes for each 'x00m away from Station y' to change. This means it will take 5 seconds for the vehicle to travel 100m. It accelerates instantly to 120km/h (without changing the rapidity of the ground tiles moving) when hitting the 'Approaching Station 1' stage, meaning it takes 6 seconds from there to reach the station, wherein the vehicle decelerates to a complete stop instantly. If one wants to maximise point yield, one should wait until the 5th second of the 'Approaching Station 1' stage to collect bonus points.